Aspartame is a widely used artificial sweetener. Since its discovery in 1965, it has been used in thousands of food products as a non-caloric sweetener. Aspartame is about 200 times sweeter than sucrose (table sugar). However, aspartame is not the only artificial sweetener found in foods; others include saccharin, neotame, acesulfame potassium, and sucralose. More than 6000 new products that contain artificial sweeteners were launched in the United States between 1999 and 2004, including soft drinks, baby food, Pedialyte, frozen foods, chewing gum and many (many) foods aimed at weight loss and blood sugar management (see other posts on the effects of artificial sweeteners and blood sugar and weight gain). All artificial sweeteners can have a detrimental effect on neurotransmitter function. This is likely to be at least partially responsible for the increased apatite that accompanies the consumption of artificial sweeteners. It can also disrupt neurotransmitter function and cause or exacerbate any number of symptoms of neurotransmitter imbalance. The reason for this disruption has to do with how these artificial sweeteners are metabolized in the body. Take aspartame for instance. Aspartame consists of two amino acids, phenylalanine and aspartate, linked to a methanol backbone. 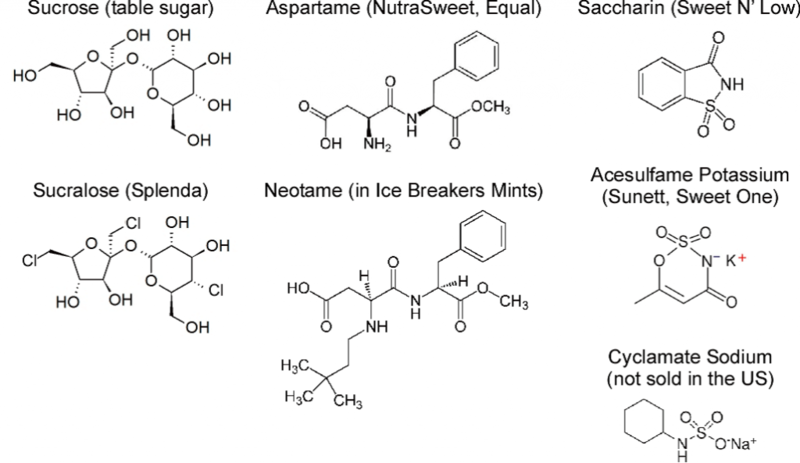 Structures of artificial sweeteners. Source: Kroger, et al and Brown et al. When metabolized, the phenlyalanine component is converted to phenylethylamine (PEA). This conversion is catalyzed by an enzyme called aromatic amino acid decarboxylase (AADC) the same enzyme which metabolizes 5-HTP to serotonin and L-dopa to dopamine. This causes competitive inhibition with the production of these neurotransmitters, which can lead to depletion and/or imbalance of serotonin, dopamine, norepinephrine and epinephrine. These imbalances/deletions can lead to and/or exacerbate any number of symptoms of neurotransmitter imbalance, including depression, anxiety, insomnia, fibromyalgia, chronic pain, fatigue, restless legs, OCD, migraines or Parkinson’s disease. While not all people that consume foods and beverages that contain artificial sweeteners will exhibit symptoms, this effect is occurring nonetheless. However, those close to the depletion edge can be pushed over the edge with artificial sweetener consumption. When symptoms of neurotransmitter imbalance are present and/or a person is undergoing amino acid therapy to optimize neurotransmitter function, artificial sweeteners should be avoided completely in order to effectively and efficiently restore proper neurotransmitter function. Yang Q. Gain weight by “going diet?” Artificial sweeteners and the neurobiology of sugar cravings. Yale Journal of Biology and Medicine 83 (2010), pp. 101-108. Kroger M, Meister K, Kava R. Low-calorie Sweeteners and Other Sugar Substitutes: A Review of the Safety Issues. Comprehensive Reviews in Food Science and Food Safety. 2006;5:35-47. Brown RJ, de Banate MA, Rother KI. 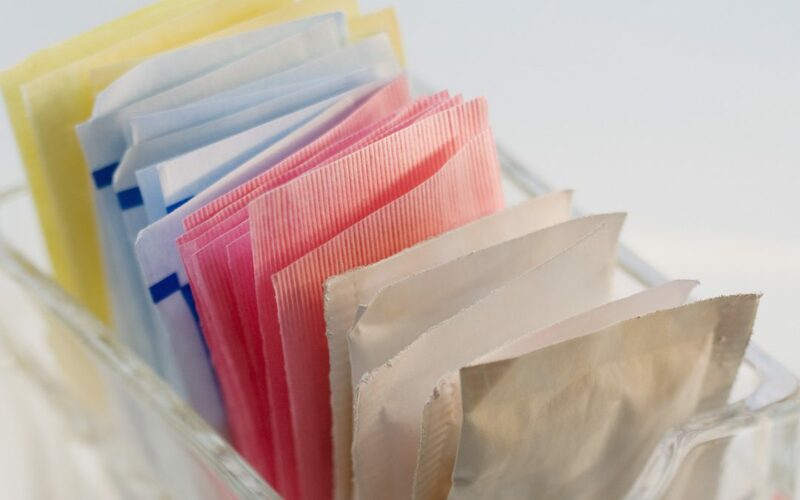 Artificial Sweeteners: A systematic review of metabolic effects in youth. Int J Pediatr Obes. Epub 18 Jan 2010.